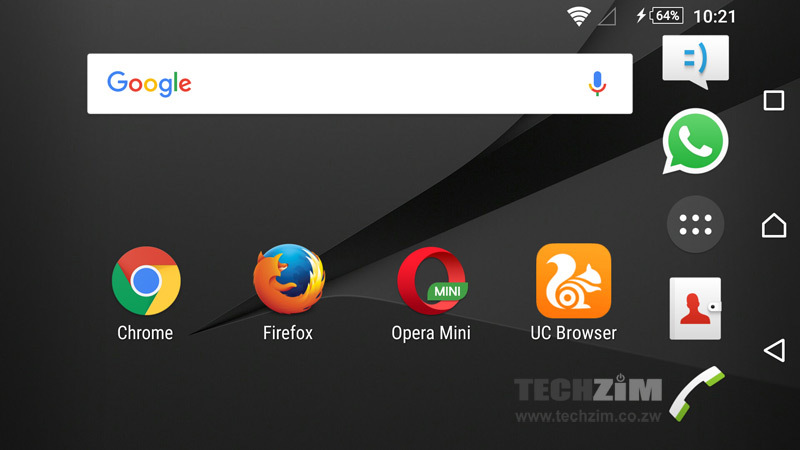 Home » Connectivity » Opera Mini is dominating and IE won’t die? Let the stats answer that. 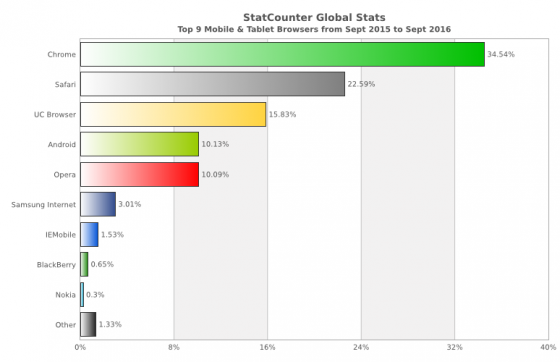 Opera Mini is dominating and IE won’t die? Let the stats answer that. So you have a browser you like to use for whatever reason. Maybe its download resuming capabilities or its data saving features. Either way with the assortment of browsers out there it’s good to know how your favourite window to the web fares amongst the competition. Starting off with mobile browsers. 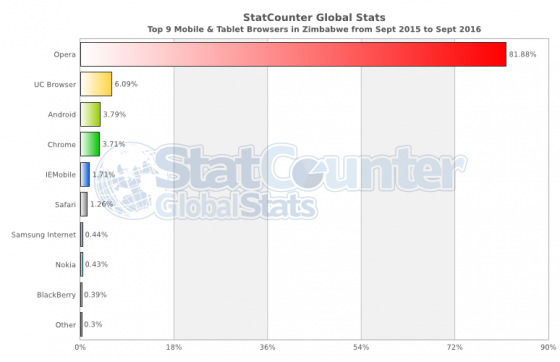 So in Zimbabwe the mobile browser arena is completely dominated by Opera Mini. I would like to believe the primary reason to this lies in the Opera Mini bundles being offered by Econet. This reason coupled by download resume functionality and web page compression trickery for data saving make it a popular web browser in Zimbabwe’s relatively expensive mobile internet department. But how does this demographic compare with the rest of the world? Well lets find out. Globally Opera falls to 5th and the lead goes to Chrome. Safari is also claiming a big chunk of market share here owing to the popularity of Apple devices globally. Data constraints aren’t an issue hence the somewhat balance of distribution of market share compared to local statistics. Retiring from mobile we now move to desktop. Again on the global turf Chrome is king wiping the floor with everything and everyone else. Might it be browser history sync over all devices via gmail? Or is it integration with google apps. One thing is for sure, whatever they are doing, we sure love it. So locally Chrome is still leading. Not a big lead but one nonetheless. Interesting to note how IE is still clawing on to quite a sizeable chunk of market share. So there is the browser brawl. 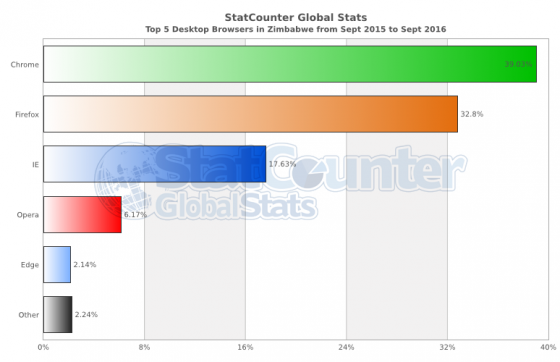 How does your favourite browser fare amongst the competition? Quite an interesting article. Opera Mini has always been a fav too, but now that I use OneFusion, data ain’t an issue now and I love Chrome on both the phone and the tablet. Desktop side, I have always loved Firefox, the customizations on Firefox just make it my favorite browser. Oddly though, according to toptenreviews.com, Firefox is rated as the best. 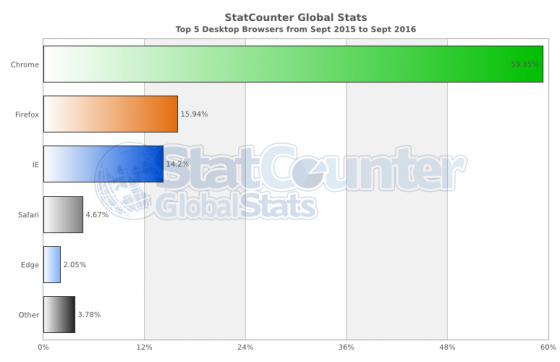 Why is the world not using the ‘best’ browser? Well, Google BROWBEATS you about using Chrome, every single Google application I open tells me to switch to Chrome. Yes, I can tell it to stop annoying me which it does … until next session. I bet many click YES just to stop the annoyance. Me? … I’m happy with Firefox. Not a smooth ride by any means, but add on capabilities are the best in the World.